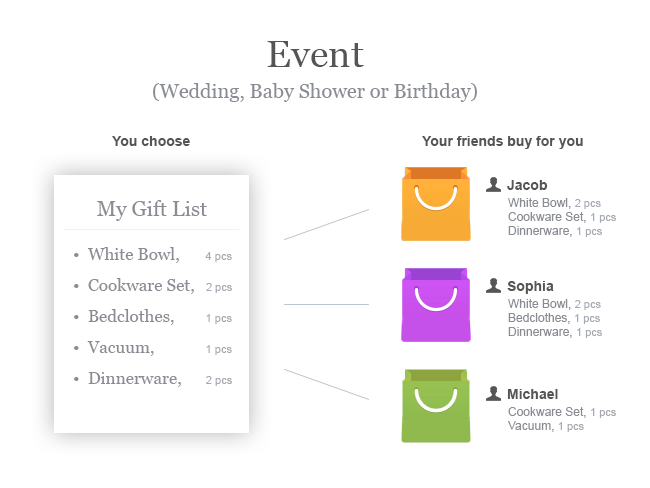 Let customers easily create gift registry lists and share them with friends to get the presents they really want. Enhance customer experience and increase your sales. The Gift Registry Add-on integrates an amazing registry service to your online store. With our Gift Registry tool you'll provide users with a great opportunity to get the gifts they really dream about, thus significantly enhancing their loyalty. Your customers will be able to create and manage an unlimited number of gift registries assigned to various important events. Let customers easily share gift registry details with their friends, drive more traffic to your website and increase your sales. — Unlimited number of events for each user. — Convenient search box that allows patrons to find the necessary events easily. — Intuitive functionality for the store administrators that allows them to moderate events with little effort. — Your store offers a special service for the customers: Each customer can create events and add a list of the products they wish to get from your store. — Other users can view created events and purchase products from any wish list. These products will be sent to the event owner. — Events can either be public (available to all users) or private (available via a secret code sent to certain users). — The Gift Registry add-on enables you to create a unique place in your store where customers can communicate with each other. This will promote the store and extend the customers’ community. Once you have installed the add-on go to the settings page, where you can set the ability to create events for users, specify the number of elements in the “Today’s events” block, set user notifications and specify the size of images (both in the events list and on the details page of an individual event). On the page “My Account” → “Events”, users can view a list of available events and create their own ones. Also, Searchbox is available to the users, it is a powerful tool for searching events. 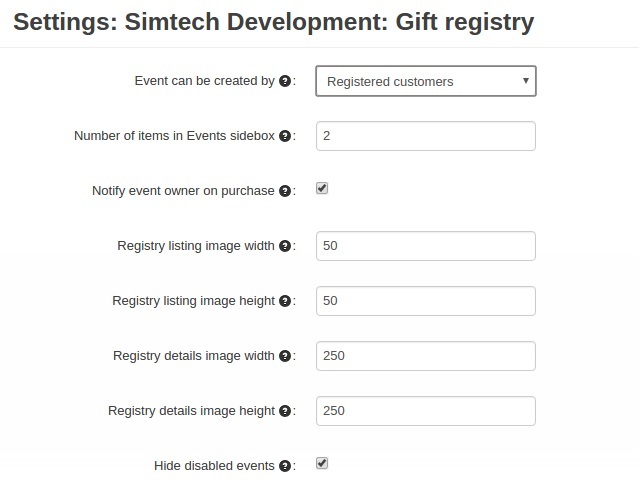 With the Gift Registry add-on it is possible to add products for an event not only on the event details page, but also on the product details page. See the screenshot below. You see that it's a great tool to integrate to your CS-Cart store. You can find more information about available settings in the User Guide. Learn more about the Gift Registry add-on in our User Guide. This add-on is developed and published by Simtech Development Ltd., a CS-Cart developer. You are guaranteed a quality add-on supported by the future versions. If you need help, please contact us via our helpdesk system. Love the simplicity of this add-on, the installation and setup went very smoothly with no hiccups and I was ready to use it right away. Simtechdev they keep surprising me with their professionalize and their excellent after sales support. Love all their add-ons and their staff. You will enjoy it when your customers like it and make your store more attractive to customers. It brings other customers who didn't know about your business. [+] The button to generate a new access key by the event author has been added in the editing event page. [~] The code has been adapted to the Smarty 3 standard. [!] The access key was changed every time the event was saved. Fixed. [+] The notification about placing the order from event has been added to the checkout page. [+] The button to set the delivery address from the event has been added in the order page in the admin panel. [+] The display of the event address has been added in the order delivery address block in the admin panel. [!] The shipping address was displayed on the checkout page when the customer creates an event for a gift. Fixed. [-] The shipping address has been removed when customer viewing an event. [!] The 404 page was displayed incorrectly with the add-on enabled. Fixed. [!] The code has been improved. [!] The Add event button was not worked when choosing to display the Email field in the Shipping address of the Profile fields settings. Fixed. [!] G index missing in the notification. Fixed. [~] The access key is now recorded into the database. It allows not to input it twice. [+] Subject text field was added. [+] The user was given the ability to edit the text of the message. [+] The ability to upload images into the body of the letter was added. [-] Private events are not shown anymore on the dashboards to the persons who are not invited. [+] The upload file button was added. [+] The ability to hide disabled events was added. [+] The ability to sort events from old to new and visa verse was added. 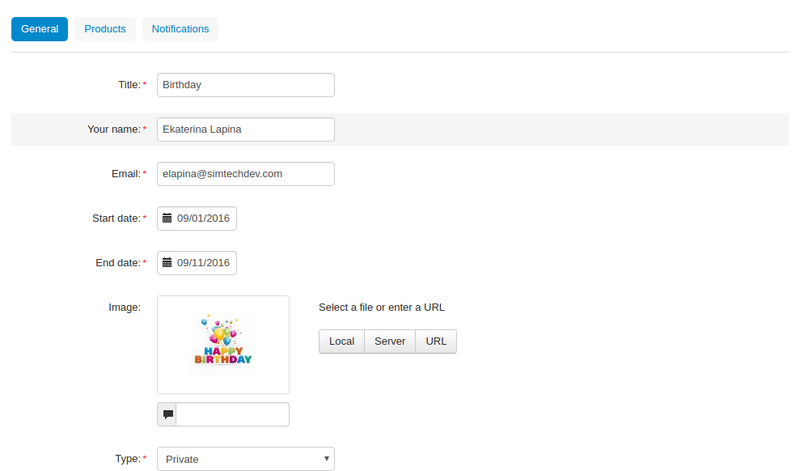 [+] The ability to add event owner address was included. It allows sending purchased products to the owner instead of the buyer. [~] The addon was proved to be compatible with CS-Cart 4.4.1 alpha. [~] A function which generates unique one-off codes was added for products from the purchase list those had not been bought after a coupon had expired. [!] The Events link was realigned in the My Account.